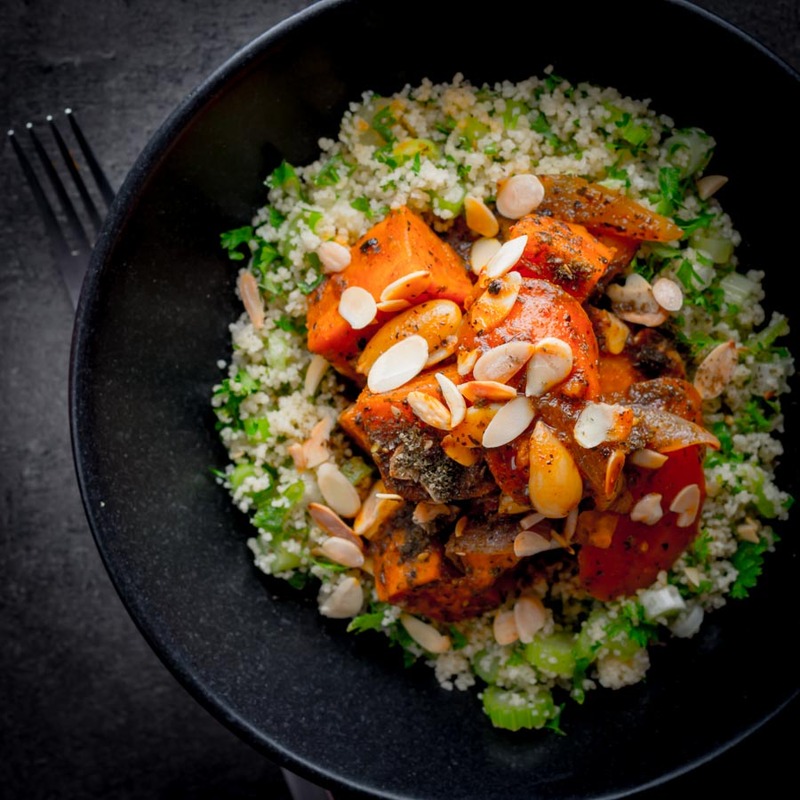 Vegetarian recipes can be really exciting and this Sweet Potato Tagine with Carrots and dates is great at breaking down carnivore barriers! After a very meaty Christmas and New Year I am delighted to be back working on a winter project. 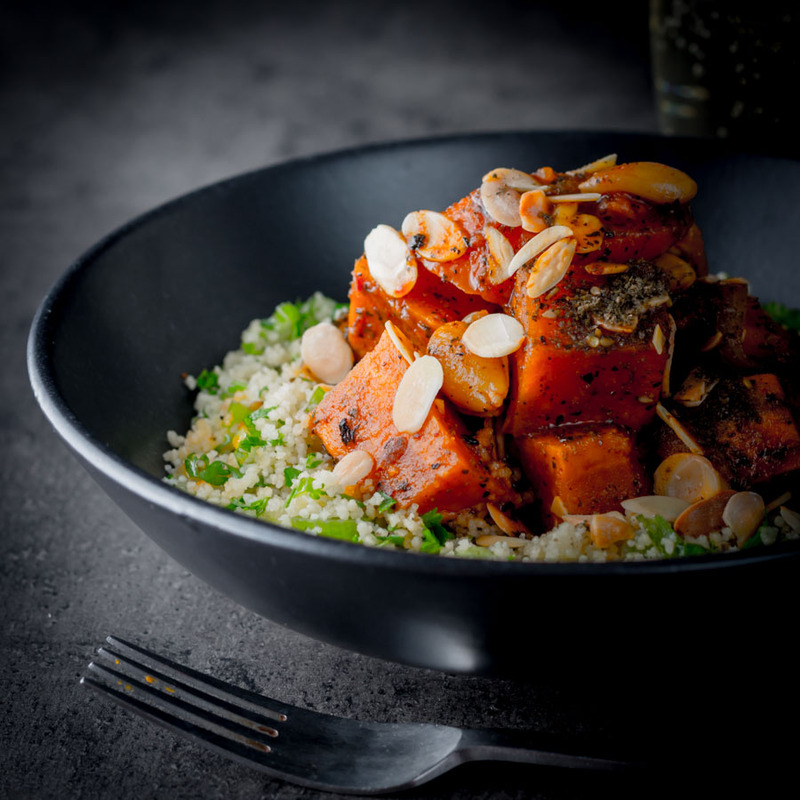 This wonderful sweet potato tagine is part of my efforts to try and work out whether or not I like sweet potato. Specifically, I am seeing if I can justify growing sweet potatoes in our plots over summer. I have to say my experiments are not going wonderfully at the moment. I have lots of side dishes but very little where the sweet potato really shines. This vegetable tagine recipe is the first where the principle ingredient stands up as the star of the show. I was in a pretty similar spot last year at this time but regular readers will know I am definitely a Pumpkin convert. You should definitely check out this Burmese pumpkin curry and my pumpkin chili recipe! It always makes me smile that I have an almost insatiable love of a little sweetness in savoury dishes. Primarily because I am completely ambivalent towards sweet dishes nine times out of ten. One of the reasons I love North African or Arabic food is the wonderful combination of savoury earthy ingredients. The combination of ingredients like pumpkin, sweet potato or pigeon alongside sweet treats like dates or dried apricots really excites me. Both my Rabbit Tagine and Butternut squash tagine recipes perfectly deomnstrate the mix of sweet and savoury. I did have to make this dish in secret though as if I had announced I put dates in my wife’s dinner she would pull a face. But just like with children what she does not know she does not worry about. She loved it even in its embryonic phase. Now I have made it half a dozen more times over the last few months it is one of her favourite dishes to cook and I get no look in. Apparently, my job is no longer sweet potato tagine, it is project sweet potato, and I should leave tried and tested to her. Can You Cook A Tagine Without a Special Pot. The answer to this is a resounding yes. I am a cook that rejects the collection of pots and pans. Primarily because I have a tiny kitchen, it is seriously less than 2 meters wide and 5m long. A shade over 100 square feet for those that work in imperial measurements. Use a pan with a tight fitting lid but like a tagine, you do need the steam to gently escape. You also want some room in the pot so that things are not to tightly packed in. Food should always be demystified, we all need a bit of North African spice in our food lives. But back to sweet potato recipes, I am currently working on a couple of soups and a really exciting pasta dish. 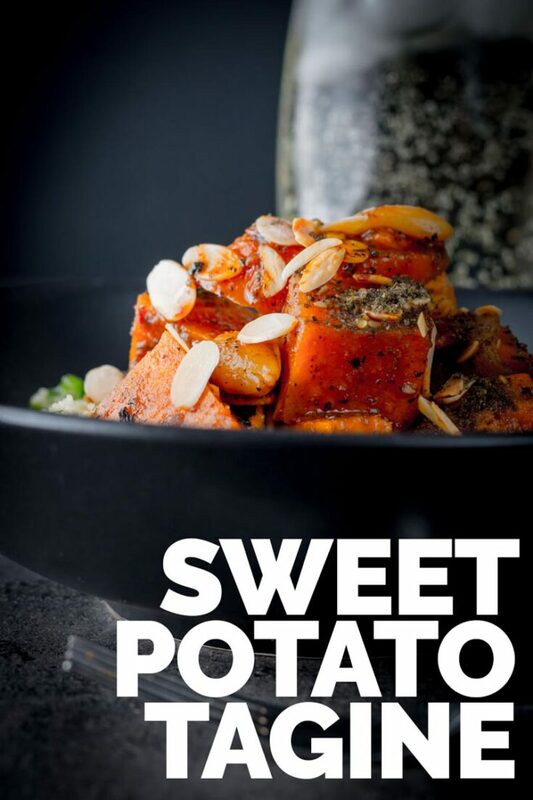 But if you have other sweet potato recipes that are not side please shout them up in the comments below. Heat the oil and butter in a heavy based pan or tagine (that you have a lid for) over a medium high heat. When the oil and butter mix is hot add in the cinnamon stick and onions stir to coat and cook for 5 minutes. Add the Harissa paste, dates, mint, honey, sumac, lemon juice, cumin and blanched almonds. Pour in the vegetable stock, season, stir then cover with a lid, rand bake in the oven for 30 minutes. The vegetables should retain some structure but be soft to the tip of a knife. 5 minutes before serving mix together all of the ingredients for the cous cous with the exception of the parsley making sure the stock is boiling and then cover with cling film and set aside. Just before serving toast off your almond flakes making sure not to burn. Fork the olive oil through the cous cous and add the parsley. I’m like you, not a big cake or sweet eater but I love the combination of sweet and savoury, especially using dried and fresh fruit. This is just up my street! Wait, so I can make this without buying a tagine? Because I’m definitely sold on that idea! I also love North African and Arabic food but I almost never make it at home (unless you count baklava?). But the flavors are wonderful and I need to branch out. Of course you can, a tagine adds a little more steam to the mix which alters the dish very slightly but I’ve not noticed a massive difference not cooking in a tagine since I broke my old one. Admitedly the joy of lifting the lid on a tagine at the table is magic but hey, I can live without it. 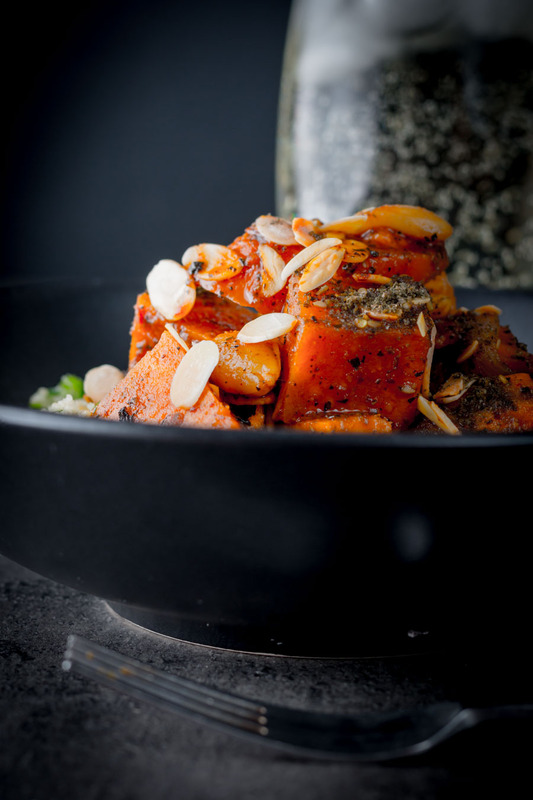 Enjoy Dawn, I love this recipe… Me and sweet potatoes don’t really get on but this is one recipe using them that I really do love! This looks very tasty, I will have to try it though have never been that fond of sweet fruit in my mains am trying to expand my horizons. My two favourite sweet potato main dishes currently are 1) baked sweet potatoes with the “magic green sauce” from A Pinch of Yum blog (cilantro, avocado, garlic, parsley pistachios water, jalapeño and oil blended) alongside black beans cooked in the liquid from the tin (a revelation) with cinnamon and jalapeño. Or 2) an amazing Diana Henry recipe of roasted sweet potatoes, red onions, and peppers slathered in spicy pimenton and cumin topped with a fried egg, garlic and parsley. ( original recipe includes chorizo and bacon but just as delicious without!). Hope this encourages you to continue your sweet potato growing. Thanks Natalie… Fruit in savoury courses doe seem to divide people, I happen to love it and use it a lot. Those two dishes sound wonderful, particularly the Diane Henry one, will hunt it down and have a try. I love all kinda of African food, but I’ve never made a veggie African dish before. I have a tajine and I love it. I’ve only cooked meat in it though. I will have to give this one a try! Really, Onion Tagine is pretty much the classic North African Vegetarian Tagine, I will try and remember to post it up at some point but hunt a recipe down it is unbelievably good! As much of a baker as I am, I don’t have much of a sweet tooth most of the time so too sweet “savory” dishes bother me. My mother being Middle Eastern though, I do love the sweet/savory balance of the dishes and plan to try this one with a few modifications next month (going vegan all month for in depth recipe testing). 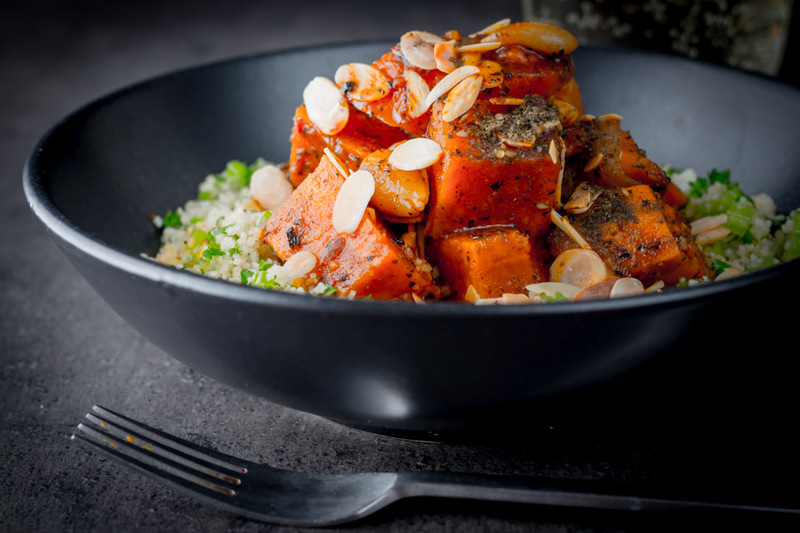 I think you should totally plant sweet potatoes… they are so healthy and versatile. You can spice them almost any which way. I’ve made them cubed into small pieces and pan fried for a breakfast hash with a bit of cumin (an alternative to tortillas in huevos rancheros), used them in soups just like pumpkin, made chipotle chili latkes, etc. The only thing I won’t do is make them too sweet or top them with marshmallows because ew. Loving the sweet potato ideas thank you, not sure I would cope on the vegan for a month thing, I am not the most self disciplined person, but you could definitely tweak this and take it in a vegan direction. Ugh, I am so the opposite. Bring on the cake, but keep the carrots, sweet potatoes and yams, please! 😉 This looks awesome, though. I love pumpkin seeds. And I am very into the way you cooked that quinoa, so smart! See I am a good boy really, I don’t like cake… IN every other way though, oopsie!